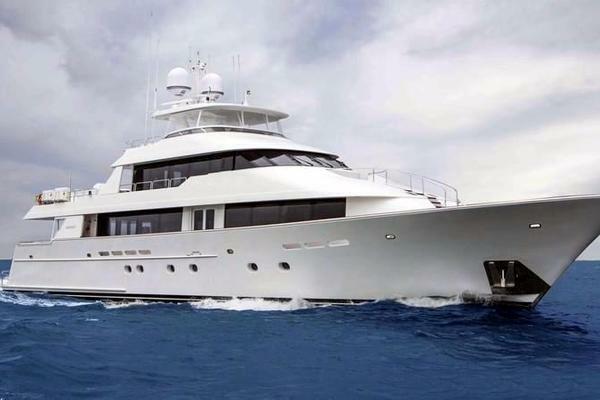 Modern Explorer combining smooth cruising and comfort; This new vessel designed by famous naval architect Joubert & Nivelt for exterior and Franck Darnet design for interior is gathering all modern and up to date equipments making this yacht very attractive and competitive. Bureau Veritas Class. 8 Guests in 4 cabins. United Yacht Sales New Jersey would love to guide you through a personal showing of this 124' Ocea Darnet Modern Explorer 2018. This yacht for sale is located in Unknown France and priced at $13,500,000. For a showing please contact us by filling out the form on this page and we will get back to you shortly! - Master Cabin: TV Sharp LCD 32 “ Dvd blu ray, Home Cinema Bose Lifestyle, 5 Bose Speakers- Forward Guest cabin: TV Sharp 32 “Dvd blu ray, Home Cinema Bose Lifestyle, 5 Bose Speakers- Starboard Guest cabin: TV Sharp 22 “Dvd blu ray, Home Cinema Bose Lifestyle- Port Guest cabin: TV Sharp 22 “Dvd blu ray, Home Cinema Bose Lifestyle- Main saloon: TV Sharp LCD 40 “ 3D Dvd blu ray, Home Cinema Bose Lifestyle? 5 Bose Speakers- Upper Saloon: Ampli Bose SA 4, Bose Accoustimass 5 system, 2 x 2 Bose cube speakers- Wheelhouse: MP3 reader, 2 Bose speakers- Crew mess: TV Sharp 22 “ MP3 reader , Home 2 Bose Speakers- Aft deck cockpit: Ampli Bose SA 4, 2 Bose speakers- Upper Deck: Ampli Bose SA 4, 4 Bose speakersThe Company offers the details of this vessel in good faith but cannot guarantee or warrant the accuracy of this information nor warrant the condition of the vessel. A buyer should instruct his agents, or his surveyors, to investigate such details as the buyer desires validated. This vessel is offered subject to prior sale, price change, or withdrawal without notice. - Radar Furuno Black box Navnet TZT- Radar Lowrance Broadband 4G HDS- Automatic Pilot SIMRAD AP80- Compas Furuno SC50- 2 VHF Furuno FM8900 S- 2 Poprtable VHF Sailor SP 3520 GMDSS- 2 INMARSAT Standard C Furuno 18GMDSS- 1 NAVTEX- 1 BLU Furuno FS 1575- SAT Phone Fleet Broadband sailor FB5001 Sonar FurunoThe Company offers the details of this vessel in good faith but cannot guarantee or warrant the accuracy of this information nor warrant the condition of the vessel. A buyer should instruct his agents, or his surveyors, to investigate such details as the buyer desires validated. This vessel is offered subject to prior sale, price change, or withdrawal without notice. Two Alternators 27 Kw, 220V/50 Hzs run par diesel generatorBattery chargerThe Company offers the details of this vessel in good faith but cannot guarantee or warrant the accuracy of this information nor warrant the condition of the vessel. A buyer should instruct his agents, or his surveyors, to investigate such details as the buyer desires validated. This vessel is offered subject to prior sale, price change, or withdrawal without notice. Crane at the bow 1200 kg capacityCrane on the upper deck 300 kg capacityThe Company offers the details of this vessel in good faith but cannot guarantee or warrant the accuracy of this information nor warrant the condition of the vessel. A buyer should instruct his agents, or his surveyors, to investigate such details as the buyer desires validated. This vessel is offered subject to prior sale, price change, or withdrawal without notice. Engines:2 x MAN V12. 2 X 1020 hp hpGenerators:2 x CAT 51 kwSteering & PropulsionPropellers:Two Rolla, 5 fixed propellers.Gearbox:ZF 331Auxiliary EquipmentBow thruster:Hydraulic Bow thruster TRAC 20Water maker:Two watermaker Tecnicomar .220 liters /hourStabilizers:Zero Speed Seakeeper GyroFuel separator:Alfa LavalAir-conditioning:Reversible airco throughout: Triple sequential Webasto with fancoils.TextWaste water treatment:HamannBoilers:Two boilers ThermorThe Company offers the details of this vessel in good faith but cannot guarantee or warrant the accuracy of this information nor warrant the condition of the vessel. A buyer should instruct his agents, or his surveyors, to investigate such details as the buyer desires validated. This vessel is offered subject to prior sale, price change, or withdrawal without notice.